This coming weekend marks the second time that I will participate in a Bloggers Heart Habitat installation with Habitat for Humanity. 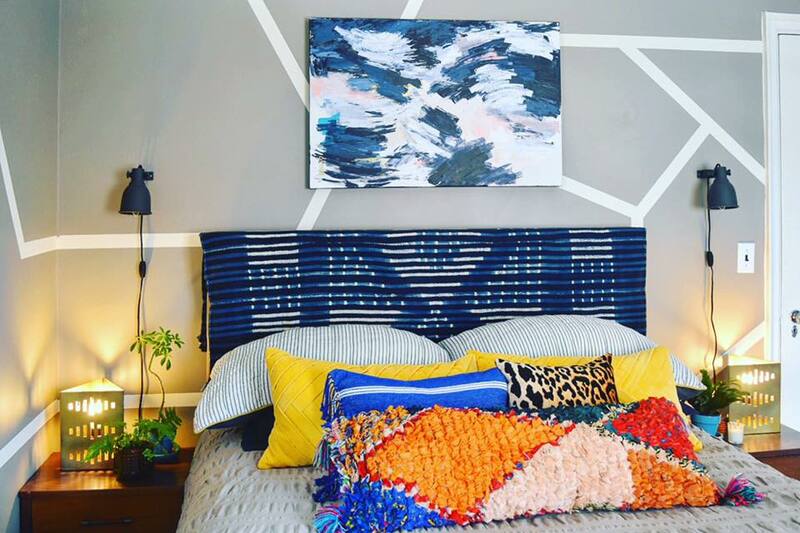 We will once again be working with our more than generous sponsor Raymour & Flanigan, and a handful of super talented interior bloggers and designers- installations like these are a favorite part of my job- it's an incredible feeling to give back to deserving families. I will take you through the before and after next week! Also in the queue is a currently underway bathroom remodel in Bronxville, NY- I'm excited that I get to work with contractors that have become my go-to in the area. Trust me, nothing is better than to have an able team to rely on. I plan to highlight their impeccable work in a future post, along with tips on how to find and maintain relationships in the home improvement field. And I cannot wait to share how I will be decorating a space in a Long Island beach house that combines style elements of the homeowners, their adult children, and more recently a new grandchild. I'll highlight how to navigate different design aesthetics and bring them together for a cohesive look that everyone is happy with. The picture above is from an Instagram challenge hosted by Chairish. 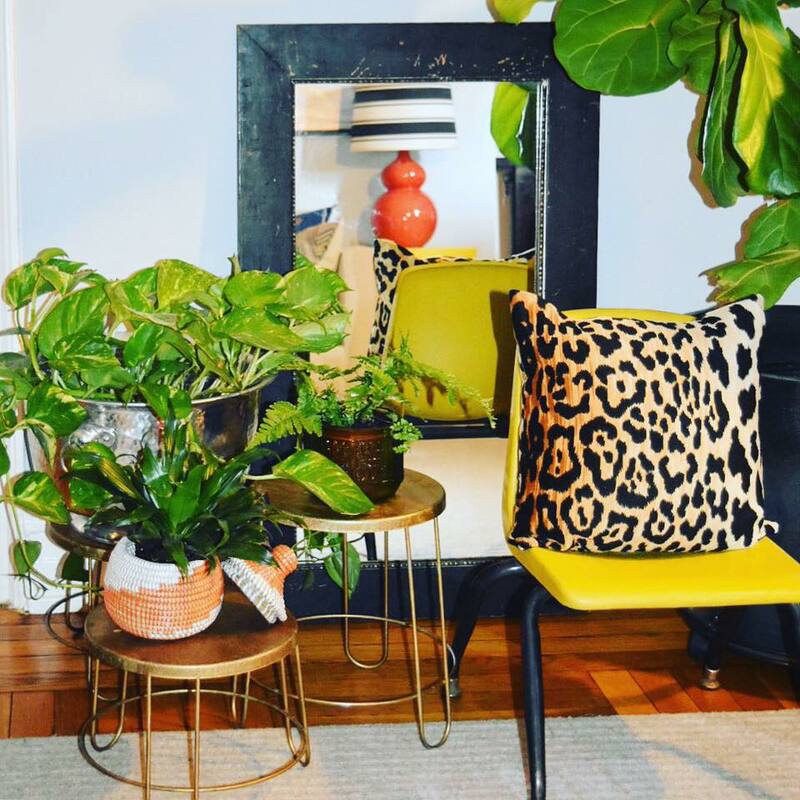 This isn't my typical decorating style, however the idea was to create a Maximalist room from scratch using only the products that they offer on their site. 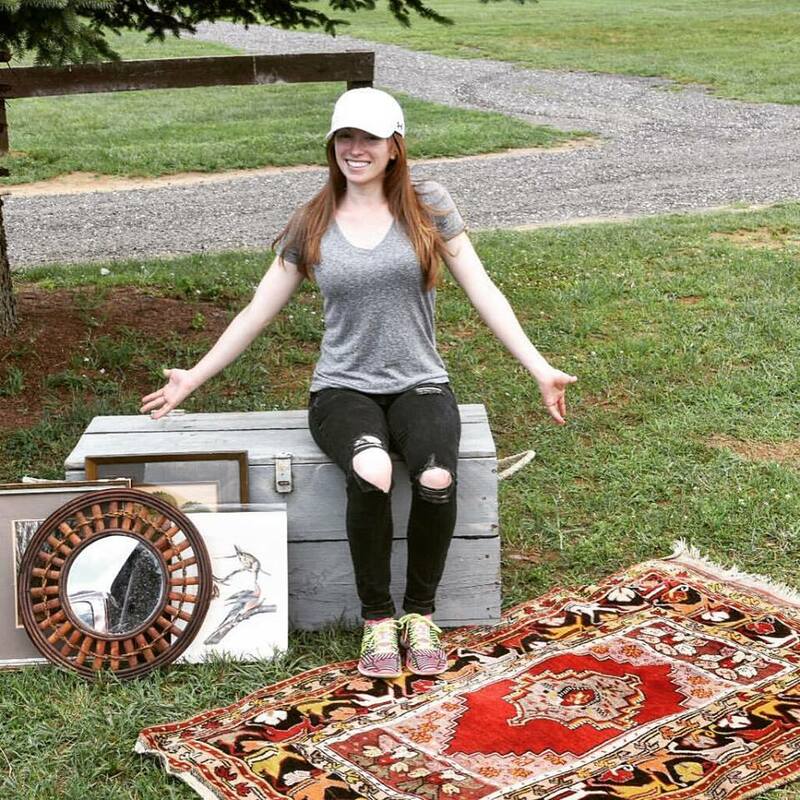 (If you haven't discovered Chairish yet, I suggest downloading the app or getting over to the website ASAP- it's full of anything and everything you could possibly imagine for home decor- all unique, many hard to find and mostly vintage pieces). And though I wouldn't consider myself to be a true maximalist, or one who uses a lot of ornate furnishings, I really really enjoyed putting this "room" together- who knows maybe I'll swap out the clean lines for loads of elaborate details!? Putting this together got me thinking about that collected look, and how one goes about creating said collection. When I'm designing a room, I'm not necessarily conscious about grabbing things that "work en masse," yet there is always a thread that ties all of the items to one another. One obvious grouping of similar objects in the Chairish room was the portrait gallery wall above the chesterfield sofa. Though, when you look closely, you'll notice that not every picture is a portrait- 2 are abstract paintings. 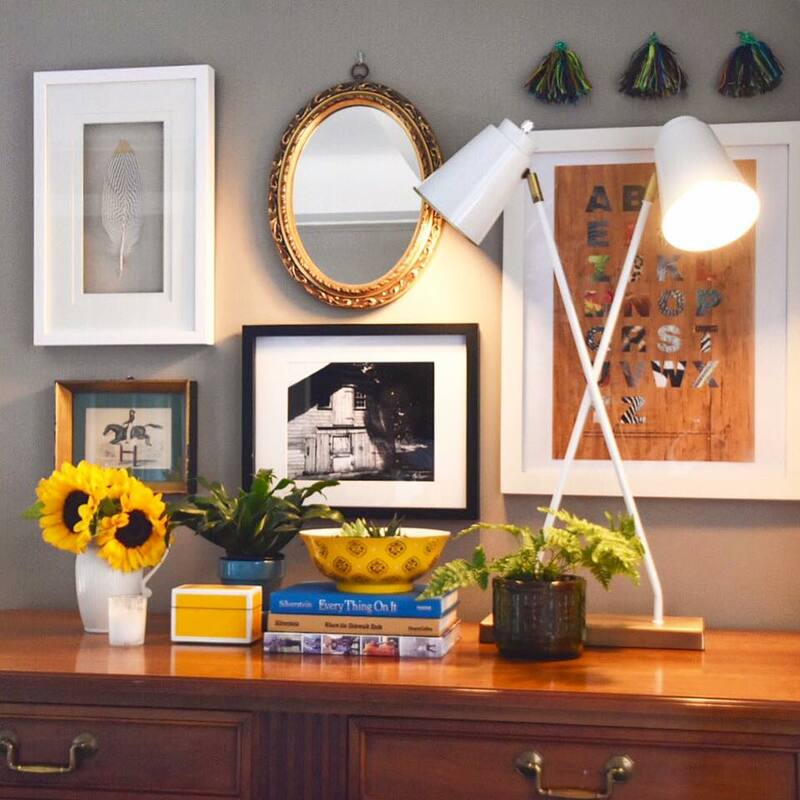 What ties those to the others is their framing- clean edges, gold and warm wood tones and simple details. But again, upon even closer inspection, one portrait is without a frame, yet its color pallet is closely related to the others. And lastly, one painting isn't a human face nor is it abstract art with frame, but rather it is that of a dog. By now I'm sure the likeness is readily apparent- an animal portrait painted in the same manner as the men and women, colors and framing alike. Another less obvious collection is the furniture and decor themselves. When I started this design, I decided to use lots of elaborate furnishings- the gilded baroque mirrors, the brilliant crystal chandelier, 2 blue lacquered french style chests, the amazing tufted leather sofa and marble and enamel statement lamps. While viewing each of these alone, they are in themselves gorgeous pieces with loads of personality, however when you group the furnishings together they don't compete, but rather elevate the look of one another. And I think that's a key element to the formation of any collection! Find colors that speak to you and replicate them in your objects, but incorporate other complimentary tones here and there in order to break up the monotony of a grouping. My obsession with carved busts and heads is real! And it came out of nowhere. One day I was so inspired by the black bust which I spotted in a shop window that I stalked the store until it opened the following week-making sure that she would find her home with me and no one else! And that was it, I was hooked- I had my "thing" and the rest found me. After falling in love with that first find, the others started to "pop up" when I was out and about, and over the course of a year, the collection took shape. That brings me to another tip: let the collection evolve over time. Additional tips to take away: Start with items that reflect your lifestyle and personality. Impactful statements are made in clusters. All of this talk about collecting has made me want to start another, and I couldn't think of a better room to display it in than our office/libarary- it has wrap around shelving after all! Maybe some brightly colored pottery, ginger jars, model cars... the possibilities are endless! If you have an established collection or one that you are beginning and you'd like me to share it on the blog or Instagram- comment below! I love to show off your talents!